There's an easy, warm charm to this magical little tome from Lydia Sherrer - though I discovered it has an alarming ability to disappear into the hands of my wife just when I'm trying to read it. A chapter in and cruising along then BAMF, it's gone, and my wife is shooing me away and telling me it's her turn with the book now. Harrumph. The story - once you can lay your hands on the book itself - tells the tale of Lily Singer, an Atlanta archive manager and, by the way, a wizard. Not a witch, as she sternly points out early on, but a wizard. And it's up to her to... well, do quite a lot actually. Between the scrapes her more outgoing friend Sebastian keeps getting into - when she'd quite frankly rather be at home with a nice cup of tea rather than tagging along with him in his gadding about - and the obligations she finds herself agreeing to, life isn't at all easy for the girl wizard about town. Still, her powers come in handy, from dodging dates with churlish chaps to uncursing curses that oughtn't have been wrought, Lily can barely keep up with her day job and her sorcerous studies. Sherrer's writing is fabulously sweet, with playful dialogue between the long-time friends at the heart of the story. It's the kind of book to put a firm, happy smile on your face, and there's frankly not enough of those in this world. In fact, I'm going to pick it up right now to have another read through episode two, Mobius Strip, which I really loved and... hey! Where's the book gone again?!? Altered Instinct previously interviewed author Lydia Sherrer here. 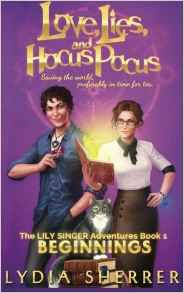 Love, Lies and Hocus Pocus is available on Amazon.